Sara Runs This Weigh: I RAN!!! Well…way early this morning, I posted about how on Friday night I had made a statement that I planned to do some sort of exercise yesterday…but, I didn’t. Last night I made the same statement about today. I was meeting up with Mark this afternoon for some Indian food and a trip to the new Austin Aquarium at 2pm. I didn’t get to bed and asleep until after 5am because at the Christmas party last night I drank 2 cups of Starbuck’s coffee and I haven’t drank any coffee for about 2 weeks. Oops. So, then I finally got to sleep, but then I really couldn’t stay that way. I had set my alarm for 11, but was wide awake at 9…I laid in bed until about 9:30 and said forget it and got up. While this did not bode well for me for the day as a whole, it did bode well for me actually doing what I said I was going to do today…go and run 3 miles. So, at 10 past 11 this morning, I started slipping on my running gear. I had checked the temp and it was 47° out. A little chilly. But, there was the potential of warming up and needing to remove my long sleeved shirt, so I put on my red tank top that I bought to wear to run the RNR half last month and pulled one of my running pullovers with the thumb holes over the top. The running capri tights I picked to wear today were a little tighter than the last time I wore them (hello, I’ve gained about 10-15 pounds since I wore them last), so for the first mile I kept having to pull them up until they stretched out a little bit and were no longer trying to squeeze my legs out of them like toothpaste from a tube. I filled my water bottle. I put my new Bluetooth earphones on and them put my sunglasses on over the top of them to hold them in place a little better and then turned on the Bluetooth connection on my phone and then turned on the music. Then I headed out the door. It was nice to just slap on my Garmin 10 and not have to worry about strapping on the heartrate monitor that goes with the 210. 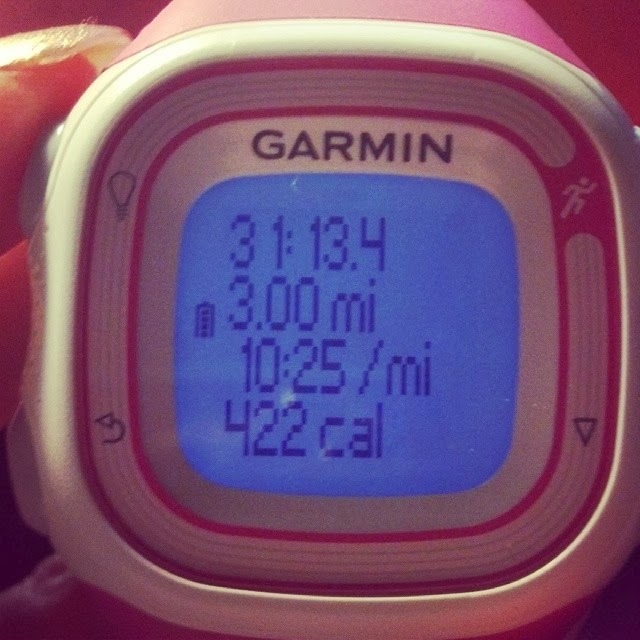 My Garmin took its time finding a connection, but by the time I was done with my warm up, it had finally found one…YAY! I had put my phone in one of my running storage belts. As I ran, there was a little bit of cutting in and out with the music, but the earphones never actually lost their connection so the music never paused. Hooray!!! The sound quality was awesome. I loved that if I wanted the music louder or softer that I could just reach up to my left ear and click the up or down button to accommodate that desire. Also, if I decided I didn’t want to listen to the song that was playing, all I had to do was reach up to my right ear and click the skip button and voila it skipped to the next song! So fabulous! There’s no way I’m taking these earphones back. I love them!!! So, I ran a little slower (but not by much) than I did when I ran the Brown Santa 5K two weeks ago. I did 3 miles flat in 31:13 where I ran the 5K in 32:13 (and I’ve noticed that all the races I run seem to add an extra 10th of a mile…so the 5K wasn’t 3.1 miles, but 3.2 miles). During my first half a mile this morning, I felt really good and even thought about making it a 4 mile run instead of a 3, but quickly cut that idea down by telling myself that I don’t need to push myself too much and that 3 miles was just fine. And it was. I was ready to be done in the last half mile. I had to pep talk myself through that last half mile. But I did it! I didn’t stop! A quick overview of my emotions surrounding today’s run. As I was making the walk up to the front of my apartment complex and before my warm up, I started getting really excited. I wanted to bounce and dance around and squeal with delight at the fact that I was about to go for a run! When I was done with the run and walking back to my apartment before stretching out, I got overwhelmed with emotion and started to tear up. It felt so good to run today. It was like seeing an old friend again that you didn’t realize you missed as much as you did until you saw them and then you cried like a baby! Haha! And then, of course, post run, I just had a nice runner’s high like I was floating on a cloud! Did I Actually Survive the Holidays?